There are few reports available in the literature on whether most of the organisms that we typically keep in aquaria use iodine, and if they do, how they obtain it (that is, from the water column or from food). Most likely, these tests have never been done on many of our favorite tank inhabitants, such as corals, despite the fact that many do contain considerable amounts of iodine (e.g., iodine in Xenia sp. and Sarcophyton sp.). Even if an organism is known to use iodine from the water column, or even require it for survival, it is unclear whether the natural sources of iodine in reef aquaria (such as foods) will fulfill the requirement. Only testing under actual aquarium conditions can give an answer, though the answer given may well vary depending on the nature of the aquarium chosen (that is, on the amounts of iodine in the imports and exports). They are known to take up soluble iodine from the water column. They are easy to grow and study in relatively short periods of time. In fact, that last reason is why I choose the macroalgae that I did. They are not among the species of macroalgae with the highest iodine levels (Table 1), but they are two primary species for which I believe aquarists would most like to optimize growth rates. It is interesting to note in Table 1 how much the iodine levels in macroalgae actually vary between species, and they also seem to vary with season, water temperature, and depth, even within the same species.6,7 Consequently, people growing other species of macroalgae may get quite different results with iodine supplementation that I obtained with the two species described in this article. Table 1. Literature iodine concentrations for wild macroalgae (except three Caulerpa values from aquaria). Those with the highest values are marked in red, and the yellow sections relate to the types tested later in this article. Do Macroalgae Take Up Soluble Iodine? The first question to address in testing whether macroalgae will be stimulated to grow with the addition of iodine supplements is whether they can absorb the forms dosed. There have been many studies on what forms of iodine are taken up by macroalgae, though none specifically on the two species of macroalgae to be tested in this article. It turns out that macroalgae in general can take up both iodide and iodate, with a preference for iodide.8-12 The degree of preference seems to vary from species to species, with most able to use both. For this reason, I chose iodide for my growth studies. What is Already Known About Iodine Requirements of Macroalgae? In short, it appears that some species of macroalgae need more iodine than others, and some may not need it at all. Consequently, it is not really possible to make any useful conclusions about whether Chaetomorpha sp. or Caulerpa racemosa will likely have any boost to growth from iodine supplementation without actually testing them under real aquarium conditions. This section gives a brief description of the growth tests such that most hobbyists can understand what was done. In a more detailed section at the end of the article I give all of the details for anyone wanting to understand it more fully. The samples of macroalgae and the water used in the studies were both taken from this aquarium. The water is expected to be at the low end of iodine levels found in aquaria since iodine had not been specifically dosed and since there was a large amount of macroalgae growing in the aquarium. Nevertheless, I do not report any measurements of iodine in this water because I am not presently convinced of the reliability of available hobby kits. I did not detect any iodine by ICP-OES (which in these samples cannot detect values below 0.3 ppm iodine) as I described in my first iodine article.1 The water in this aquarium had no detectable nitrate using Salifert and LaMotte kits (<0.5 ppm), and no detectable phosphate using the Hach kit (<0.02 ppm). The growth studies were carried out in small clear plastic saucers lit by fluorescent lights. There were 14 samples of each species tested. Half of these got supplemental iodide (0.05 ppm) in their water, and half got no iodine supplementation. All samples also got an additional 4 ppm of nitrate and 0.06 ppm of phosphate added to them to mimic typical aquaria and to try to ensure that growth was not nutrient limited. There was no stirring or aeration of the samples. All samples had a 100% water change every day. The macroalgae samples were weighed at the start of the study, and then again at then end. The saucers were placed in a double row along the middle 2.5 feet of the 4 foot fluorescent lamps, about 5” below the lights as shown in Figure 1. The Chaetomorpha sp. was grown for 10 days, and the Caulerpa racemosa for 21 days. Figure 1. Schematic showing the arrangement of the double row of sample saucers under the fluorescent lamps (shown in blue). 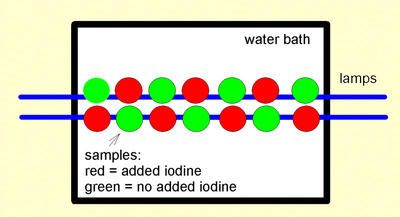 The samples with supplemental iodine (red) alternated positions with those that did not (green). Iodine Effects on Chaetomorpha sp. It turns out that the Chaetomorpha sp. grew tremendously during the course of this study. One specimen grew to more than six times its starting weight during this 10-day period, and even the slowest specimens grew to more than three times their starting weight. The average sample getting supplemental iodine grew to 5.1 times its initial weight during the 10-day period. The average sample getting no supplemental iodine grew to 4.7 times its initial weight during the 10-day period. Statistical analysis of this 9% difference in growth (5.1x vs. 4.7x) shows it to not be statistically significant (p= 0.47 using a standard t-test). Figure 2. The growth of Chaetomorpha sp. samples as a function of position across the test apparatus. Interestingly, the growth seems to be a function of placement along the fluorescent tubes. Samples at the ends of the rows apparently grew more slowly. 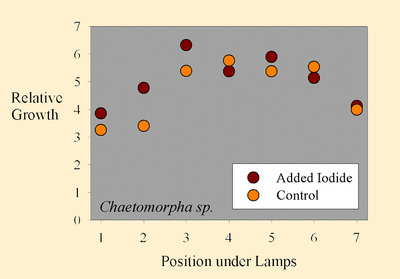 This data is shown in Figure 2, where the “Position under Lamps” refers to the side to side positioning, and each position has one that has added iodine and one that does not. The samples in the middle of the experiment had a higher growth rate than those near the sides of the water bath. This result is likely to have come from differences in lighting intensity as a function of position, since those at the ends were partially shielded from those portions of the lamps off to one side by the sides of the water bath (Figure 1). Regardless of whether it is statistically significant or not, or whether a larger study would have been clearer, the actual observed difference in growth rate (9%) is small. Most aquarists will not be so concerned with optimizing the growth rate that 9% would be critical. It turns out that the Caulerpa racemosa grew more slowly during the course of its 21-day study. Two specimens even died (one in each group). Each Caulerpa racemosa sample started as just a stolon (the growing tips) of the plant, with no thalli (the round balls), though a few had rhizoids (roots). By the end of the test, many samples had rhizoids and several had thalli, and most lost a portion of the stolon near the end that was cut. The average sample getting supplemental iodine grew by 17% wet weight during the test. The average sample getting no supplemental iodine grew by 12% wet weight during the test. These values are, however, misleading. Most of the samples did have considerable new growth, but they also died from the end where they were cut off of the mother macroalgae. The variation between samples was quite large, with some samples actually losing weight overall, and several gaining more than 40% of their original weight. Statistical analysis of this 41% difference in growth (17% vs. 12%) shows it to not be statistically significant (p= 0.66 using a standard t-test and 0.70 using the paired t-test). Figure 3. The growth of Caulerpa racemosa samples as a function of position across the test apparatus. 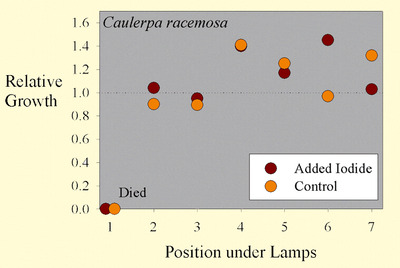 Interestingly, the growth of the Caulerpa racemosa does not seem to be as dependent on the position under the lamps (Figure 3). Perhaps Caulerpa racemosa does not require as much lighting for optimal growth as does Chaetomorpha sp. Neither species of macroalgae tested were shown to grow statistically faster with supplemental iodine. Perhaps larger studies would show such an effect. Nevertheless, it does not seem that a strong case can be made for iodine supplementation if the goal is growth of these two species, most especially in the case of Chaetomorpha sp ., where the growth is very good with and without supplemental iodine. Whether any other organisms benefit from iodine supplementation is even less clear. The literature does not support the need, but testing has been very limited. I’ve initiated some additional experiments on mushroom corals ( Actinodiscus sp.) by attaching them to the same types of saucers as in this study and I’ve let them equilibrate in the refugia of my main tank for several weeks. These mushroom corals may, in the future, be the basis of additional growth studies to be carried out in a similar fashion to those described here for macroalgae. In future articles, I hope to report on depletion rates of iodine in aquaria, as well as on testing methods, but so far I’m not comfortable with the results that I’ve obtained with the iodine kits that I’ve tried. Before saying anything definitive about them, I plan to do more extensive testing of them. This section gives a more detailed description of how the growth tests were carried out. The samples of macroalgae and the water used in the studies were both taken from this aquarium. I am not reporting any measurements of iodine in this water because I am not presently convinced of the reliability of available hobby kits. I did not detect any iodine by ICP-OES (which in these samples cannot detect values below 0.3 ppm iodine) as I described in my first iodine article.1 The water in this aquarium had no detectable nitrate using Salifert and LaMotte kits (<0.5 ppm), and no detectable phosphate using the Hach kit (<0.02 ppm). The growth studies were carried out in small clear plastic saucers, about 5”across and 1” deep. They contained about 125 mL of water. It turns out that the amount of iodine added to each saucer (0.05 ppm = 0.006 mg/saucer) was likely adequate to provide the growing macroalgae with the amounts of iodine typically present in the new tissue that were grown. For example, in Table 1 the various samples of Chaetomorpha sp. are reported to contain 24, 68, 144, 362, and 1124 ppm dry weight iodine. The amount of new tissue grown in the saucer with the greatest growth had just under a gram (wet) of total new growth, or about 0.13 grams dry weight (most were significantly less). That tissue would then take up 0.003, 0.009, 0.02, 0.05, and 0.15 mg of iodine. Over the growth period of 10 days, the amount of iodine added to each saucer was 10 days x 0.006 mg/day = 0.06 mg. Consequently, there was more iodine added than would be accounted for through growth by all but the literature sample with the highest iodine content. Still, the macroalgae may use the iodide and then release it in another form, and also the samples may have added more tissue at the end of the test than at the start simply because they were larger then, and so might have been iodide depleted on those later days. The saucers were kept at 80-82 ºF by being submerged about 1/2″ in a circulating water bath. The bottoms of the saucers were almost completely in contact with the water to maximize the temperature control on the samples by placing the samples on thin metal rods. The samples were lit by placing them under 2 48” fluorescent lights (40 watts each). One was a “cool white” bulb by ABCO and the second was a “Softtone” by Phillips. The lights were on for 12 h/day. The saucers containing the samples were placed in a double row along the middle 2.5 feet of the 4 foot fluorescent lamps, about 5” below the lights as shown in Figure 1. The entire apparatus was partially covered to reduce evaporation, though some evaporation (and consequent increase in salinity in the saucers) would presumably take place each day before the next 100% water change. Two liters of water from the aquarium was collected. Nitrate was added by spiking the entire 2 liters with 0.8 mL of a stock solution of sodium nitrate in DI water (6.96 g of NaNO3 in 500 mL; 10,160 ppm nitrate ion). The final nitrate concentration in the test water was 4.1 ppm. Phosphate was added by spiking the entire 2 liters with 2.0 mL of a stock solution of sodium phosphate dodecahydrate (Na3PO4 · 12 H2O) in DI water (0.117 g in 500 mL; 58 ppm phosphate ion). The final phosphate concentration in the test water was 0.06 ppm. This nitrate and phosphate was added to mimic typical aquaria and to try to ensure that growth was not nutrient limited. The two liters of water was then split in half. Half was used as is (already spiked with nitrate and phosphate) for the control samples. Iodide supplementation was accomplished in the other half starting with a 1,090 ppm iodine stock solution comprising sodium iodide in water (0.644 grams NaI in 500 mL of DI water). This standard was freshly diluted each day 1:10 in DI water (making 109 ppm iodide), and then added to the other liter of the nitrate- and phosphate-spiked aquarium water. There was no stirring or aeration of the samples. All samples had a 100% water change every day. The macroalgae was weighed at the start of the study, and then again at then end using a high precision electronic balance. Each macroalgae sample was gently patted dry with a paper towel prior to weighing. The Caulerpa racemosa samples consisted of just the growing tips (stolons) of the plant, with no thalli (the round balls) and only a few had rhizoids (roots). They were cut to 3-7 inches and then allowed to recover in the aquarium for 4 days prior to weighing and initiation of the test. By the end of the test, many samples had rhizoids and several had thalli, and most lost a portion of the stolon near the end that was cut. The initial weights of the Caulerpa racemosa ranged from 0.125 g to 0.715 g. Final weights were only slightly higher, and in some cases lower. One sample in each cohort (+/- iodide) died and completely disintegrated during the 21 days of the test.